Detailed Message: TF221122: An error occurred running job Incremental Analysis Database Sync for team project collection or Team Foundation server TEAM FOUNDATION. 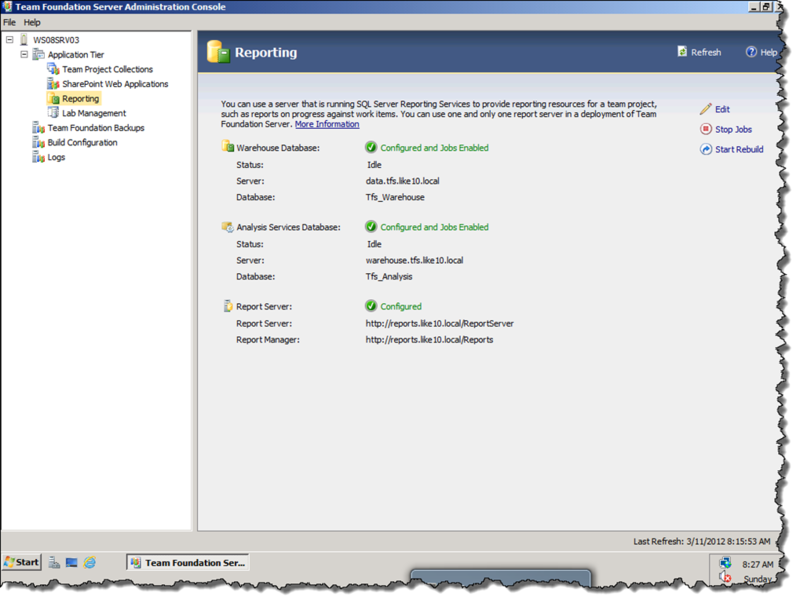 Verify the Reporting Configuration using the Team Foundation Server Administration Console. Check the state of the warehouse using Grant Holliday’s Administrative Report Pack for Team Foundation Server 2010. This will allow you to easily monitor the status of the cube. In this particular case it was failing processing both the Full and Incremental jobs (ignore the 2 successful runs at the end for now). Exception Message: Internal error: The operation terminated unsuccessfully. OLE DB error: OLE DB or ODBC error: Login failed. The login is from an untrusted domain and cannot be used with Windows authentication. ; 28000. Errors in the high-level relational engine. A connection could not be made to the data source with the DataSourceID of ‘Tfs_AnalysisDataSource’, Name of ‘Tfs_AnalysisDataSource’. The issue here is that the account running the SQL Server Database Engine did not have permissions to connect and process the cube. This is easy to fix by connecting to Analysis Services and adding the domain account that runs the database engine to the TfsWarehouseAdministrator Role in the Tfs_Analysis database. Once you have granted those permissions you can manually process the data warehouse and cube for Team Foundation Server by connecting to the web services on the application tier. 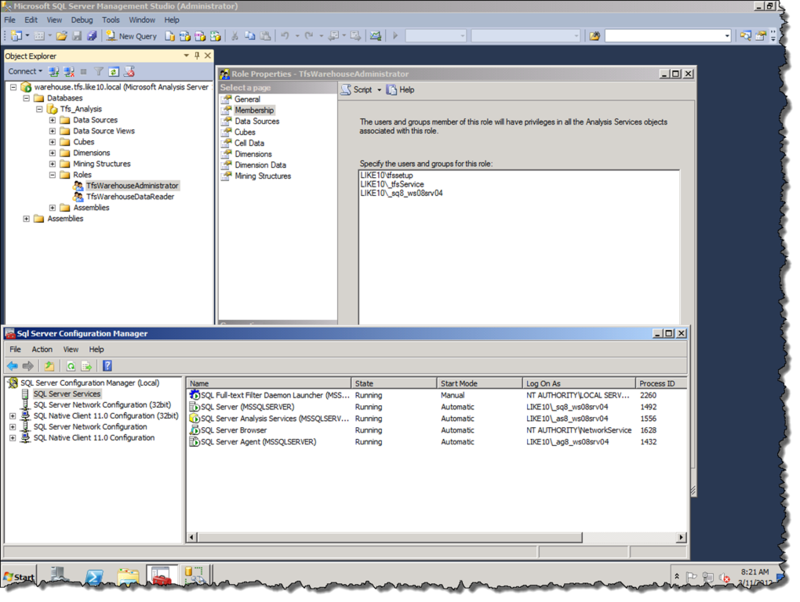 Note: Do not manually process cube using SQL Server Management Studio that method is not supported. Verified the status of both runs by checking the Cube Status Report. You can see the Full (12:16) and Incremental (12:58) jobs were processed successfully. Necesito procesar el cubo ya que tengo varios archivos corruptos, pero desde el servicio Web no me arroja la siguiente pagina con el XML despues de asignarle el valor a Invocar. If the web services are not functioning or inaccessible I would recommend you address that issue first, I am guessing you are not passing the correct values. 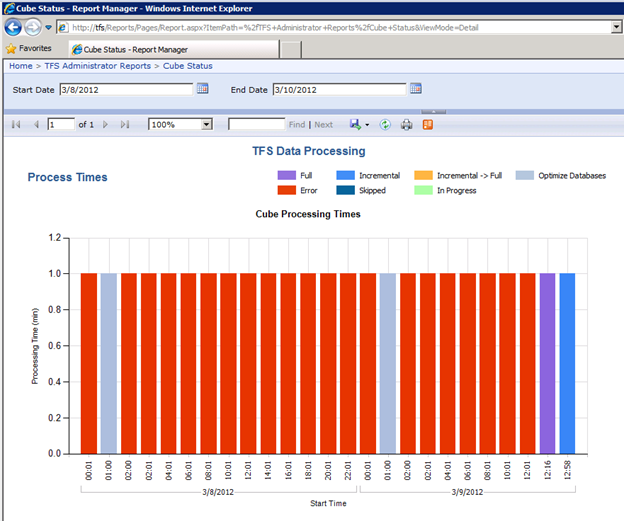 The TFS Administration Console is the only supported way to rebuild the cube, you cannot process the cube using SQL Server Management Studio (SSMS). Oh my goodness! You have no idea how glad I am that your post was still available. 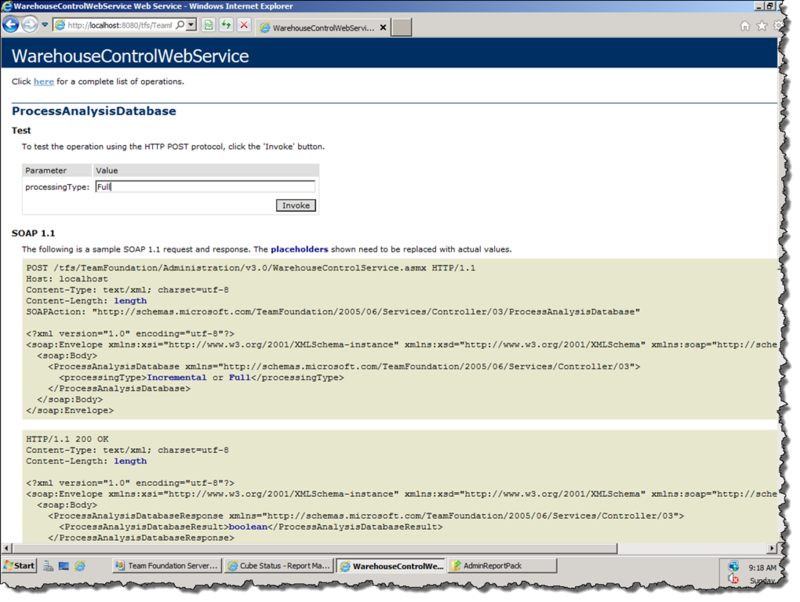 We have just built a new TFS 2013 environment and we were getting the same error. Searching all over we could not find anything that would address our issue. More bizarre everything else worked except for that 2hr job, just like you mentioned. The fix was the same, Add the domain\user acct that the MSSQL service was running as to the cube administration so it could reprocess. The next scheduled process worked without issue!